Under Our Wings is an outreach program that fosters literacy, foundational character building, and environmental stewardship through its mentorship initiative, interactive games, and inspiring bilingual series, Avian Kingdom: Feathered Tales. The program delivers these life lessons through the support of sponsors and volunteers that share the same values and community spirit. 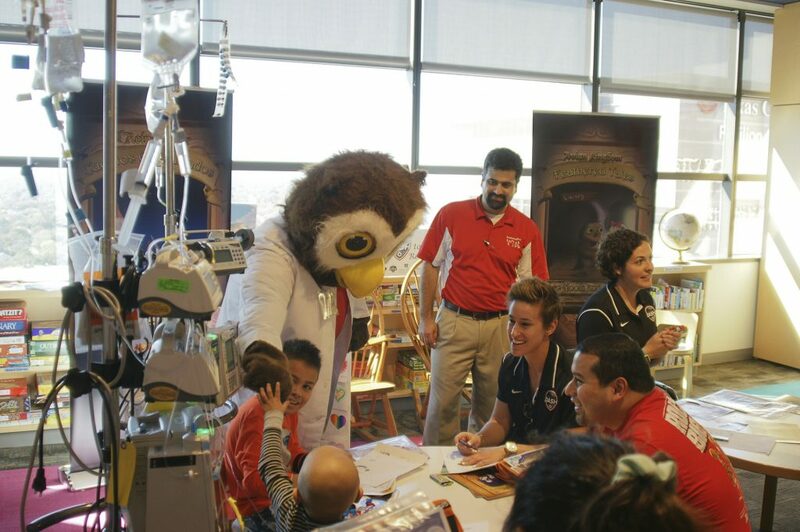 With the help of Taquerias Arandas and Arandas Bakery, the kids at the Texas Children’s Hospital, Children’s Hospital Colorado, Houston Area Women’s Center, and the Loaves and Fishes Soup Kitchen will enjoy Valentine’s packets filled with books and activities delivered by players from the Houston Dash and Dynamo soccer teams and, of course, Dr. Hoots. **Our De-Raptor Codex was used to create kid-friendly messages. Please refrain from using messages like "get well" on your cards. If you want to get even more involved, join our team of happiness heroes by becoming a sponsor or volunteer, please visit Valentine’s Week 2018 for more information.